Dell has released a photo printer that uses the same Zero-ink technology found in the Polaroid PoGo Instant Digital Instant Mobile Photo Printer and PoGo Instant Digital Camera. Dell’s Wasabi PZ310 Ultramobile Photo Printer holds up to 12 sheets of adhesive-backed ZINK Paper, and can connect to a digital camera via PictBridge or wirelessly to a camera phone or computer via Bluetooth. ZINK Zero-ink technology replaces the hassles and expense of ink or toner with paper that is embedded with cyan, yellow and magenta dye crystals. These crystals respond to targeted heat pulses of specific duration to form all the colors of the rainbow and produce prints that are long-lasting, smudge-proof, water-resistant, tear-proof and fade-resistant. The Wasabi produces prints measuring 2" x 3" (50 x 76.2mm) and the unit is small enough to fit in a pocket, measuring 4.8" x 2.9" x 0.9"(122.5 x 75.0 x 24.2mm) and weighing 225g (8 oz) with the battery. The 450mAh Li-ion battery can produce 15 prints per charge with prints produced in 55 seconds. For those without Bluetooth, the Wasabi can also be connected via a USB A connector. Be warned though, not every Bluetooth enabled phone will work with the Wasabi Mobile Printer. They need to support the FTP, BIP or OPP Bluetooth transfer profiles. The Apple iPhone and G1 Android phones don’t currently support these transfer profiles so owners of those and other incompatible phones will be restricted to a USB connection. 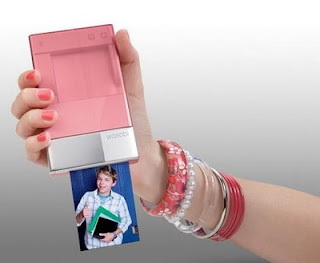 The Wasabi PZ310 Ultramobile Photo Printer using ZINK technology is available now from Dell for USD$149.